This article is about the actor. For the ice hockey player, see Kevin Klein. 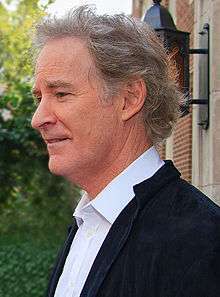 Kevin Delaney Kline (born October 24, 1947) is an American film and stage actor, comedian, and singer. He has won an Academy Award and two Tony Awards, and is a 2003 American Theatre Hall of Fame inductee. Kline began his career on stage in 1972 with The Acting Company. He went on to win two Tony Awards for his work in Broadway musicals, winning Best Featured Actor in a Musical for the 1978 original production of On the Twentieth Century and Best Actor in a Musical for the 1981 revival of The Pirates of Penzance. He made his film debut the following year, opposite Meryl Streep in Sophie's Choice (1982). For his role in the 1988 comedy hit A Fish Called Wanda, he won the Academy Award for Best Supporting Actor. In 2003, he starred as Falstaff in the Broadway production of Henry IV, for which he won the Drama Desk Award for Outstanding Actor in a Play. He has been nominated for an Emmy Award, two BAFTA Awards and five Golden Globe Awards. His other films include The Big Chill (1983), Silverado (1985), Cry Freedom (1987), Dave (1993), The Hunchback of Notre Dame (1996), The Ice Storm (1997), In & Out (1997), De-Lovely (2004) and My Old Lady (2014). Kline was born in St. Louis, Missouri, the son of Margaret Agnes Kirk and Robert Joseph Kline (1909-1996). His father was a classical music lover and an amateur opera singer who owned and operated The Record Bar, a record store in St. Louis that opened in the early 1940s, and sold toys during the 1960s and 1970s; his father's family also owned Kline's Inc., a department store chain. Kline has described his mother as the "dramatic theatrical character in our family". Kline's father was Jewish, from a family that had emigrated from Germany, and had become an agnostic. Kline's mother was a Roman Catholic of Irish descent, the daughter of an immigrant from County Louth. Kline was raised in his mother's Catholic faith. He has three siblings, Alex, Christopher, and Kate. He graduated from the Saint Louis Priory School in 1965. 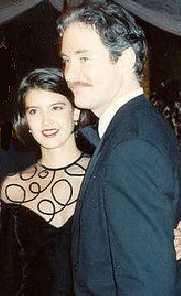 In 1997, the school named its new auditorium the Kevin Kline Theater, and Kline did a benefit performance of selections from Shakespeare at the dedication. The Company traveled across the U.S. performing Shakespeare's plays, other classical works, and the musical The Robber Bridegroom, founding one of the most widely praised groups in American repertory theatre. At Juilliard he studied singing with Beverley Peck Johnson. In 1976, Kline left The Acting Company and settled in New York City, doing a brief appearance as the character "Woody Reed" in the now-defunct soap opera Search for Tomorrow. He followed this with a return to the stage in 1977 to play Clym Yeobright opposite Donna Theodore as Eustacia Vye in The Hudson Guild Theater production of Dance on a Country Grave, Kelly Hamilton's musical version of Thomas Hardy's The Return of the Native. In 1978 he played the role of Bruce Granit, a matinée idol caricature, in Harold Prince's On the Twentieth Century, for which he won his first Tony Award. In 1981, Kline appeared with rock diva Linda Ronstadt and singer Rex Smith in the New York Shakespeare Festival's Central Park production of The Pirates of Penzance, winning another Tony Award for Best Leading Actor in a Musical, for his comically dashing portrayal of the Pirate King. In 1983, he played the role in a film version of the musical, also with Ronstadt, Smith and Angela Lansbury, which had a limited theatrical release. In the ensuing years, Kline appeared many times in New York Shakespeare Festival productions of Shakespeare plays, including starring roles in Richard III (1983), Much Ado About Nothing (1988), Henry V (1984) and two productions of Hamlet, in 1986 and 1990 (which he also directed). Kline had a reputation for being so picky about his roles that it was actually detrimental to his career, and thus earned himself the nickname "Kevin Decline". Other awards have included Drama Desk Awards, Golden Globe awards, a Gotham Award, a Hasty Pudding Theatricals Man of the Year Award, and a St. Louis International Film Festival Lifetime Achievement Award. He was inducted in the American Theatre Hall of Fame in 2003. He has a star on the St. Louis Walk of Fame. Film reviewers have praised Kline. Newsday critic Lynn Darling wrote on July 13, 1988 that Kline "has proved himself to be one of the most talented and versatile American actors of his generation." Kline played the title role in King Lear at the Public Theater, and took the lead role in a Broadway production of Cyrano de Bergerac opposite Jennifer Garner. That production was forced to close temporarily after only 11 performances as a result of the Broadway stagehands' strike, but subsequently reopened. Cyrano was filmed in 2008 and aired as part of PBS's Great Performances series in January 2009. In January 2008, Kline won a Screen Actors Guild award for his portrayal of Jaques in Kenneth Branagh's film As You Like It, adapted from Shakespeare's play. The film premiered theatrically in 2006 in Europe. It bypassed theatres and was sent straight to HBO in the U.S. Kline's film The Conspirator premiered during the Toronto International Film Festival in 2010 and was described as an "old fashioned historical thriller". It was well received by most critics. Kline also starred in the 2012 comedy Darling Companion alongside Diane Keaton. In December 2004, Kline became the 2,272nd recipient of a star on Hollywood Walk of Fame, for his contributions to the motion picture industry, located at 7000 Hollywood Boulevard. ↑ "Theater honors put women in the spotlight". Pittsburgh Post-Gazette. Retrieved December 22, 2015. 1 2 "Robert J. Kline, 87; Was Opera Buff, Owner of Record Stores". St. Louis Post-Dispatch. September 7, 1996. Retrieved June 7, 2008. 1 2 "Peggy Kirk Kline profile". St. Louis Post-Dispatch. June 8, 2000. ↑ "Kevin Kline biography". filmreference.com. 2008. Retrieved June 7, 2008. ↑ "Kevin Kline star bio". Tribute. 2008. Retrieved June 7, 2008. ↑ "Herald-Journal - Google News Archive Search". google.com. ↑ Anthony Tommasini (January 22, 2001). "Beverley Peck Johnson, 96, Voice Teacher". The New York Times. ↑ Charles Isherwood, "This King, This Courtier, These Kevin Klines", nytimes.com, January 1, 2008. ↑ "100 Years, 100 Laughs". American Film Institute. 2000. Archived from the original on June 3, 2008. Retrieved June 7, 2008. ↑ "American Theatre Critics Association". Americantheatrecritics.org. 2014-01-29. Retrieved 2015-02-07. ↑ Hetrick, Adam (September 25, 2007). "Morton, Sarandon and Baker Will Join Kline in Broadway's Cyrano; Casting Complete". Playbill. Retrieved September 26, 2007. ↑ "Kline gets Hollywood star", TheAge.com.au, December 4, 2004. ↑ "Kevin Kline". latimes.com. Retrieved 2016-06-12. ↑ Pelly, Jenn. "Frankie Cosmos". Pitchfork Media. Retrieved March 5, 2014. 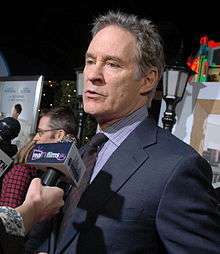 Wikimedia Commons has media related to Kevin Kline.